The multisensor-system µsurf custom meets challenging demands for measurement quality, convenience and flexibility. It can be designed exactly according to requirements. It is ideally suited for fully automated quality assurance in all deployment settings, from clean rooms to laboratories and production environment. Using µscan select, you can measure up to 100 times faster than with conventional probe systems. µscan select can be fully automated and conveniently integrated into quality assurance processes using industrial-strength interfaces. The modular design is flexible and supports the combination of a variety of sensors. 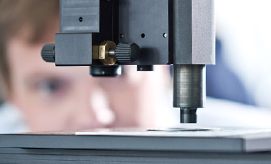 NanoFocus offers you all services for our measurement technology from a single source: from contract measurements and training to maintenance of your measuring system.